QPST flash tool is the best smartphone tool which allows you to flash stock firmware on Qualcomm smartphones and tablets. This QPST Tool latest v2.7.453 and previous v2.7.447 is available here for free download for windows. This QPST Tool supports all Qualcomm based smartphones and tablets. if your device has Qualcomm chipset then you can use this tool to flash the firmware on your mobile devices.The best benefit of using this Qualcomm product support tools is that it will support multiple mobile devices at the same time. Almost you can connect different devices to the chipset with a great consist of Qualcomm compatibility. This Qpst flash tool is simple and easy to use. The QPST flash tool comes with an easy interface. you can easily flash stock firmware quickly on your Smartphone or tablet. You need to download and install this tool for your PC windows to flash your mobile device. This Qpst tool is a free tool for windows users. Now download and install it in your computer windows to use this latest mobile tool. All you have to do is download it from the given link. Click the link and free download this tool for your PC windows. With the help of this tool, you can easily monitor the status of active devices, available serial ports, and active clients. 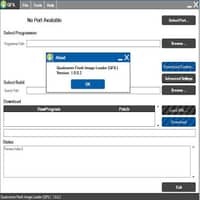 This tool allows you to save the service programming data to file and flash the same service programming file on multiple devices. It also allows you to backup and restores nonvolatile memory contents. The QPST tool for Android smartphones allows users to create backups of their systems through the tool and then restore it to the new firmware. This saves the time of manually creating a backup which is difficult to restore after flashing process. This QPST repair tool Supports all windows versions of Windows 7, Windows 8, Windows 8.1, Windows 10, Windows Vista and Windows XP. So if you wish to download and more information about this Qualcomm product tool latest version for your PC windows operating system. then click the link for free download. Now single click the given download link for download Qualcomm QPST download and Qpst USB Driver within few seconds.